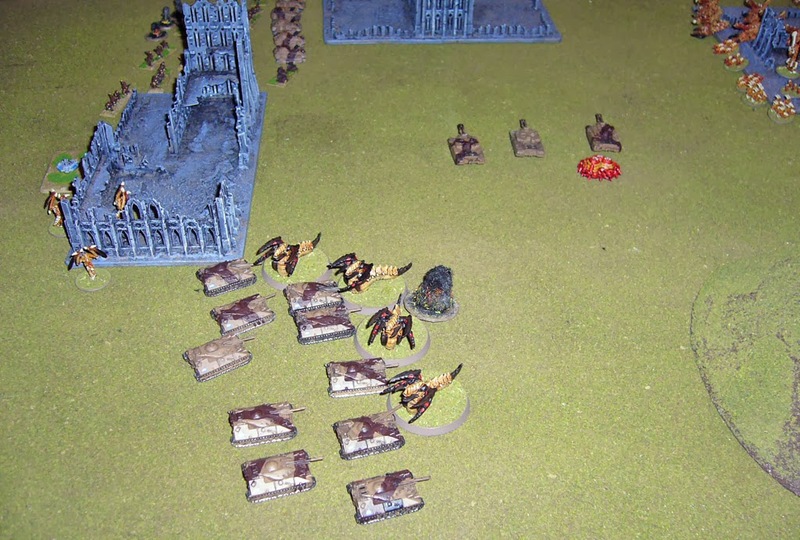 Last game report from the weekend using my Tryanids against Jonathan's Steel Legion. 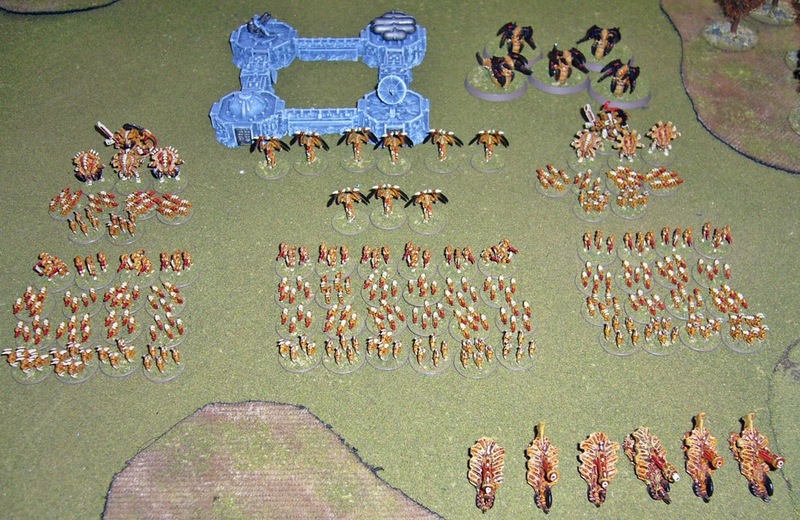 I decided to use the same infantry horde list I used in my game against the Marines. Jonathan's figures are all from Dark Realm Miniatures Pax Arcadia, except for two stands of Exodus Wars Robots that John uses for Ogryns (Ogrynbots?). 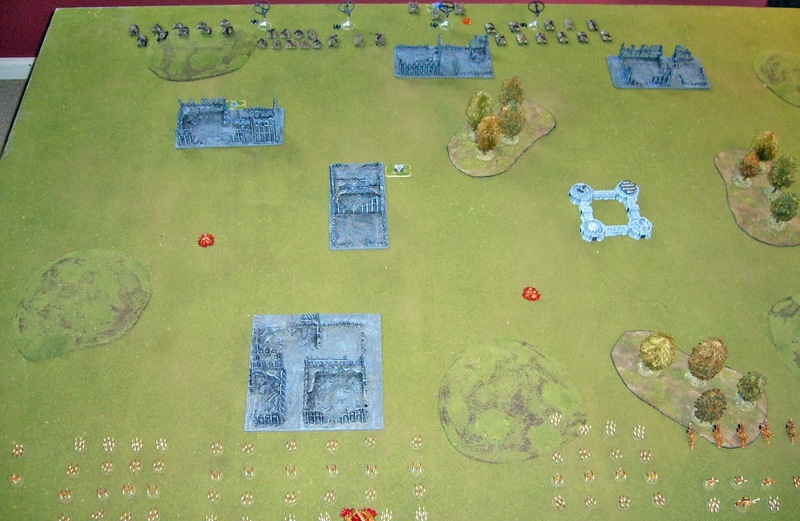 Here's the deployment, I'm really spread out across the left and centre of my deployment zone to avoid artillery fire. And view from the left. Guard win the Strategy Roll, and make me activate first. I move my big swarm ahead to the ruins and then the first artillery strike kills two Warriors and two Gaunt stands from one of my left swarms. 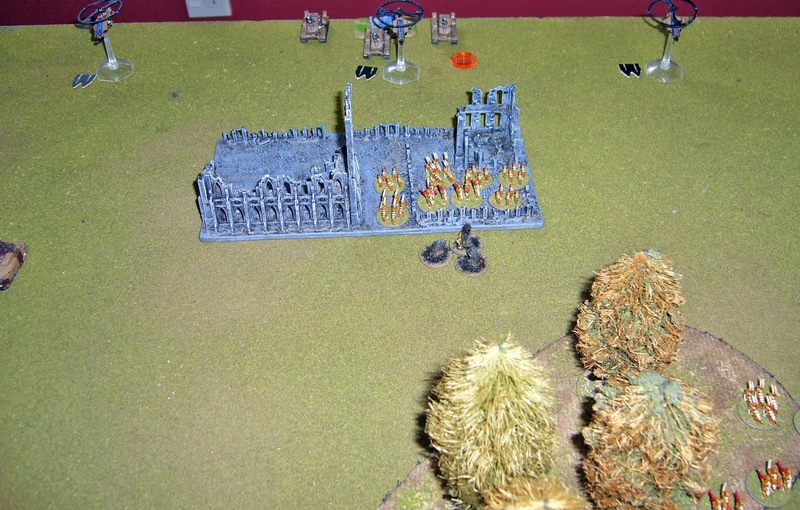 Undaunted I press forward, as do the Guard with both Tank regiments doubling up and firing. 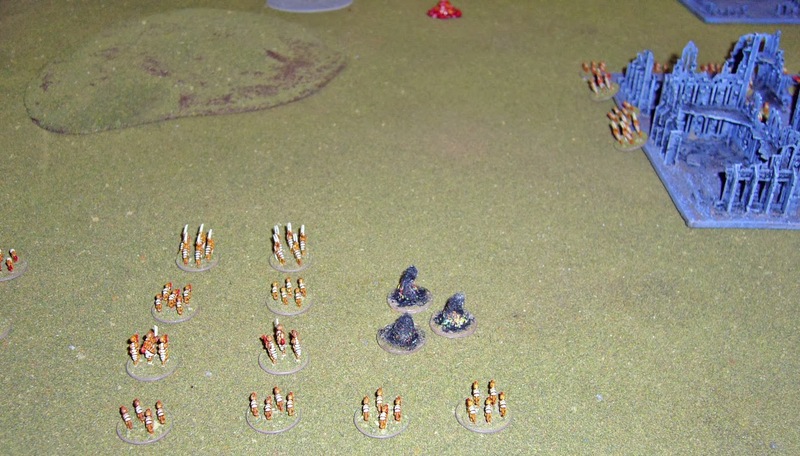 My Exocrines march to their left and my Blitz not wanting to up against a Guard Tank Company. Here's a view from the left again. Tyranids win the Strategy Roll! I double up with a Zoanthrope Swarm, firing and putting a Blast Marker on the Tank Company and getting into support range. My Gaunt Swarm then pounces on the Tank Company and wipe it out for the loss of only a couple of Gaunts, with assistance from the Zoanthrope Swarm (the Zoanthropes doing two Macro Weapon hits). This Tank Company is also the Guard Break Their Spirit Victory Condition, so the humans are in big trouble with this loss. The Guard fire on another Gaunt Swarm the remnants of which march determinedly towards the Human Blitz..
View from the side again. 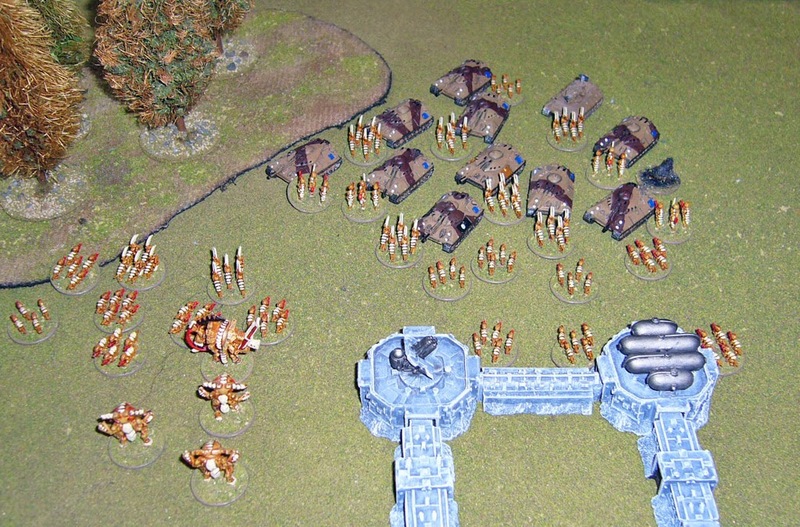 The Trygons pop out of the ground, disappointed to find they are once again surrounded by three enemy formations. In fact it is difficult to fit them in to the tight space available. 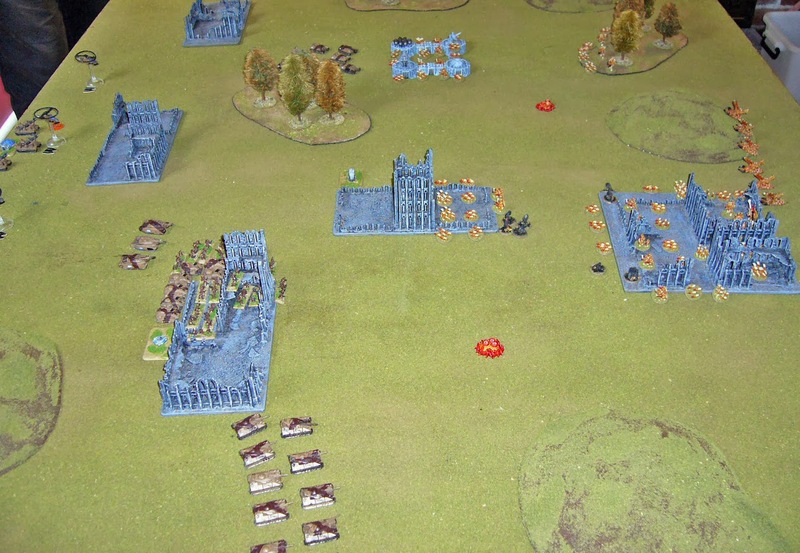 The Lictors also show up, 3 in the ruins inbetween the Tank Company and Infantry Company, and 6 in the ruins near the Guard blitz. Guard win the Strategy Roll. 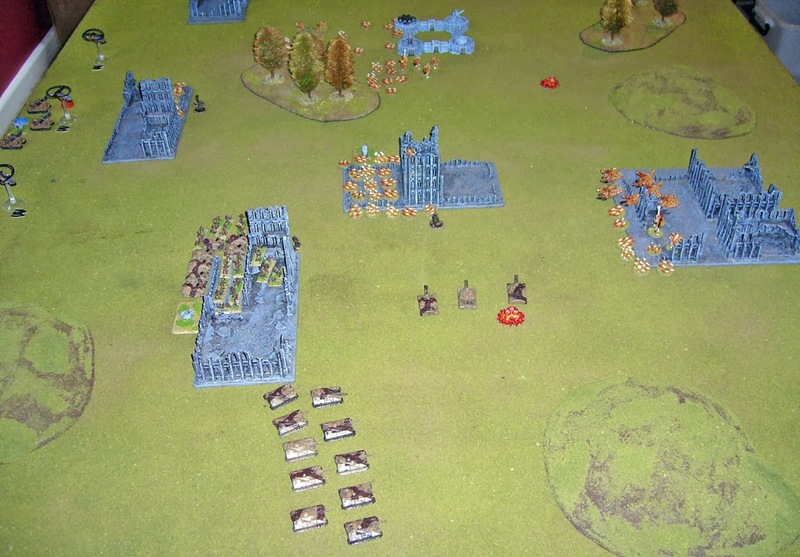 The Infantry Company moves out and firefights the large Gaunt Swarm, with support from two Shadowswords. 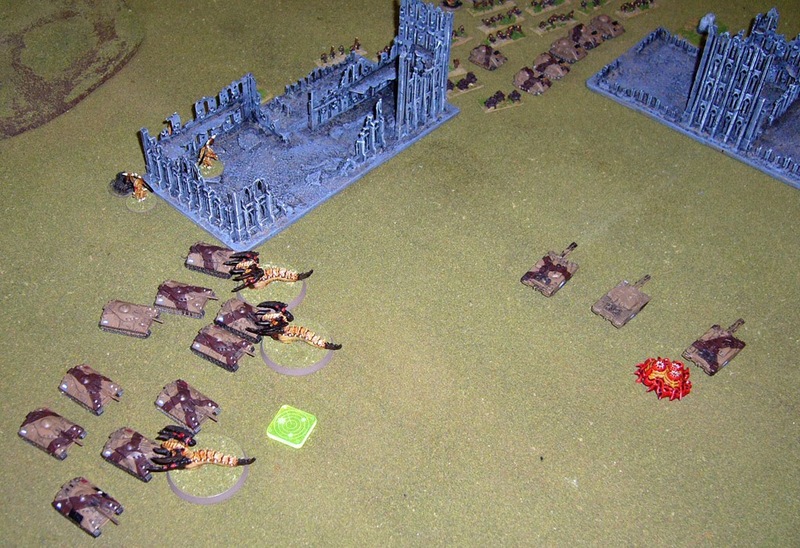 The Gaunts lose many units and fall back, for the loss of two Chimeras and a Guardsmen. The two Ogrynbots at the front absorb fire from the Gaunt Swarm and also some hits from the nearby supporting Trygons (if you can call hitting on a 6 supporting). 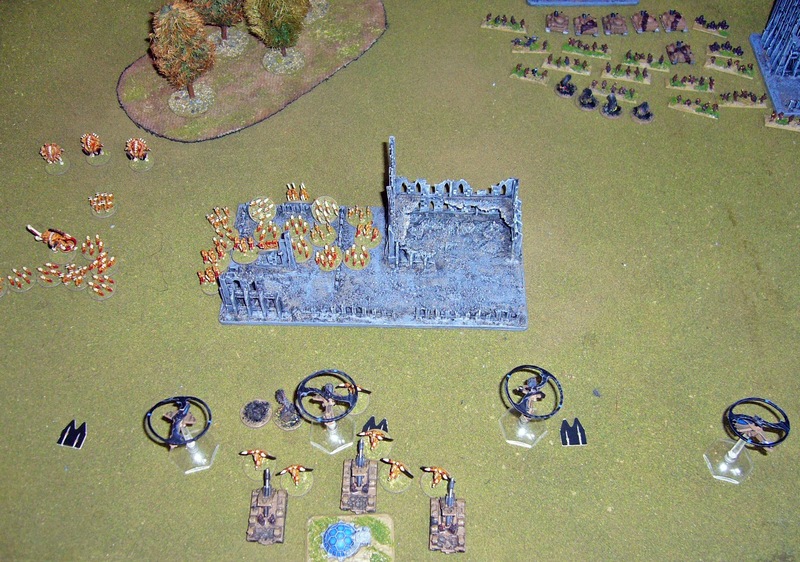 The Guard then retain with their artillery breaking another swarm near their Blitz. Amazed they were not crossfired to death like in the last game, the Trygons gleefully pounce on the Tank Company, feeling smug as they take advantage of the nearby cover to avoid the overwatching Vultures. Only one Vulture can fire at them, but it does so, killing a Trygon! 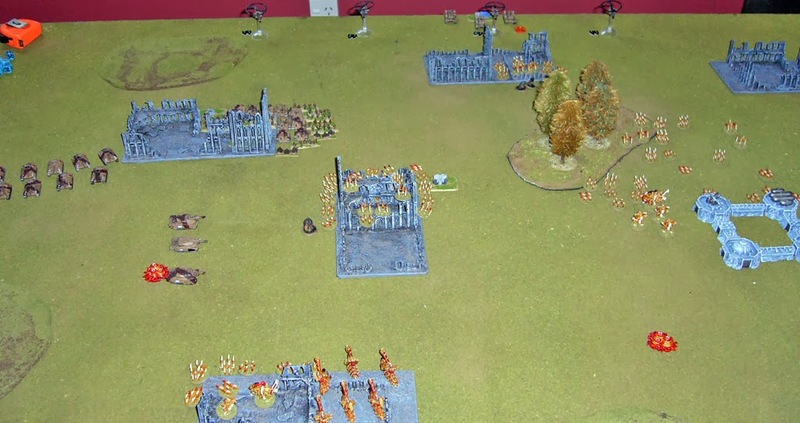 The Shadowswords then open fire killing three Exocrines breaking the formation, and the Leman Russ advance past the Trygons firing and killing the other two Zoanthropes from the formation near my Blitz. I concentrate my remaining forces near the Guard Blitz, moving two more swarms into support positions before assaulting with the Lictors. 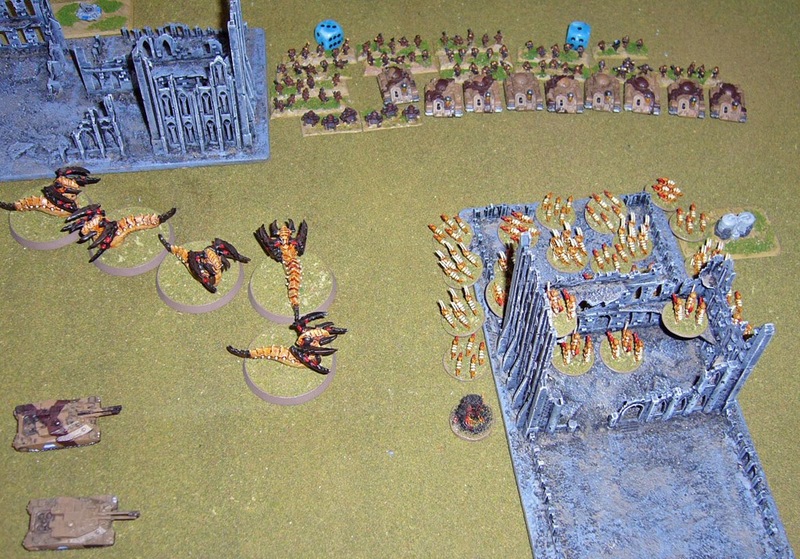 Having used their overwatch action against the Trygons the Vultures can no longer overwatch fire against the Lictors (which would have almost certainly have destroyed them). The two Guard formations are wiped out! I win 2-0 having achieved "Break Their Spirit" and "Blitz" victory conditions. Well in review losing their big Tank Company start of Turn 2 was something the Guard needed a miracle to recover from. As it turned out they almost got it with the series of victories in turn 3. 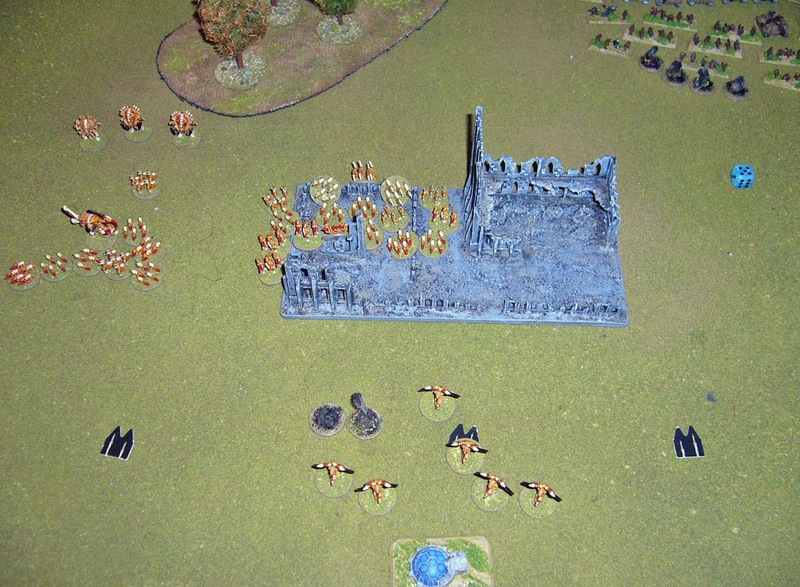 In the end they were just too thin on the ground though, and they couldn't defend everywhere. Having the Vultures intermingled with the Artillery was also problematic, they would have been better over 5cm away in front to screen them which might just have made the difference. 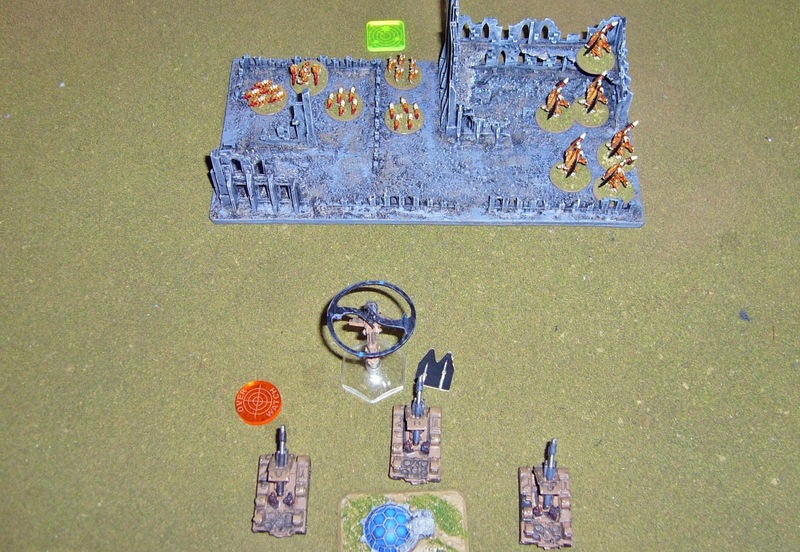 This is of course also a very low activation count Imperial Guard army (just 6 activations! ), and I think Jonathan would do well to swap out the Shadowsword Company for two single Shadowswords and a Sentinel squadron as he is considering, or perhaps even consider taking one rather than two tank companies (heresy I know Jonathan!) 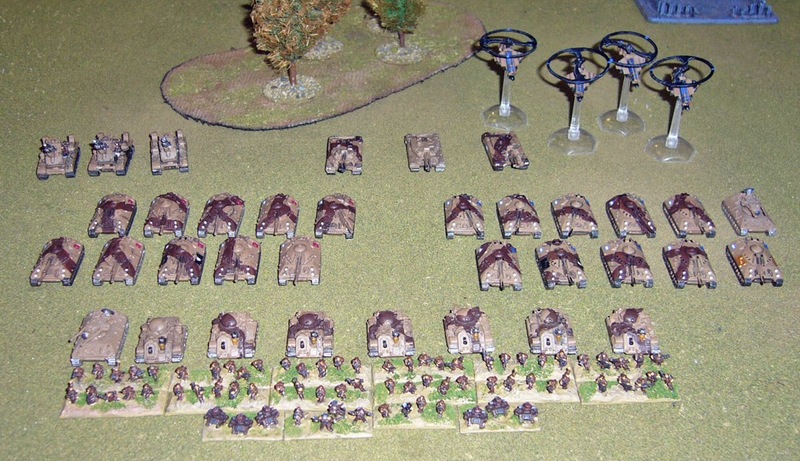 and more infantry or other cheaper formations. Lastly, I also hope my Trygons will do something useful one day...! Edit: Also Jonathan has also added his own report on the game on his blog. Epicomp 2013 Galleries are up!